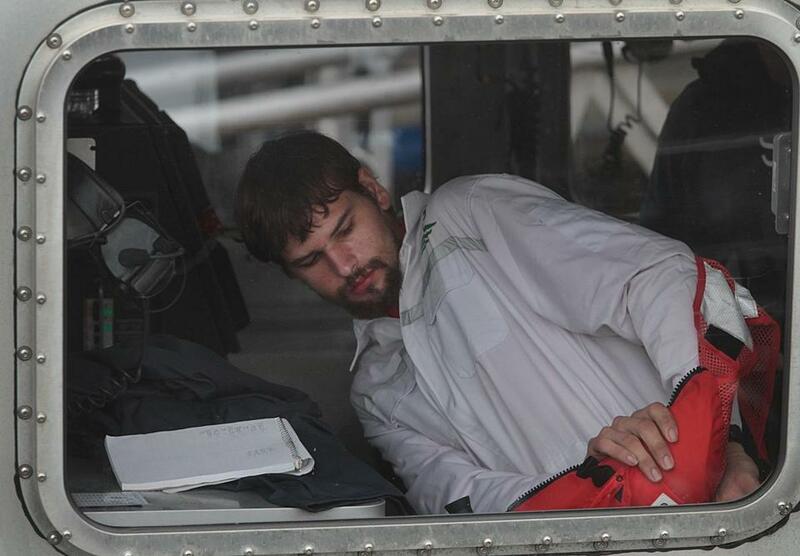 Nathan Carman arrived in Boston Tuesday after he was found in a lifeboat at sea. His mother is presumed dead after their boat sank. MIDDLETOWN, Conn. — The 22-year-old man who survived a week at sea after a boating tragedy that led to his mother’s presumed death said Wednesday that he believed his vessel was seaworthy and that a multistate criminal investigation into the fishing trip had compounded his grief. Authorities said Carman ventured some 80 miles farther out to sea than his mother, Linda, had expected. They are investigating whether Carman had made repairs to his 31-foot vessel that potentially made it unsafe. At the Rhode Island marina where Carman set sail, a boater told authorities Carman had taken the unusual step of removing the boat’s trim tabs, which keep the vessel from listing. Authorities wrote in court papers seeking the search warrant that repairs that Nathan Carman was making to the boat himself rendered the vessel unsafe. The developments came as court records showed that Carman was once a suspect in the 2013 shooting death of his grandfather, 87-year-old John Chakalos. The grandfather left an estate worth more than $42 million to his four adult daughters, including Carman’s mother, according to the Associated Press. “It was just very sudden and very shocking to be in the water, to first figure out where I was, and then everything after that: trying to find my mom, signal for her, and not being able to do that the next day and the next day until I was rescued,” he said. He said he didn’t have time to radio for help, and swam to the life raft, which inflated automatically. He said he never saw his mother. After the Coast Guard had suspended a lengthy search, he was spotted by a Chinese freighter after he fired a flare to get the crew’s attention. As Carman made his account public, police and court records filed in Connecticut in 2014 showed that although he had been a suspect in his grandfather’s death, a court determined there was insufficient evidence to arrest him. The police affidavit filed in court showed that he had purchased a rifle in New Hampshire before his grandfather’s murder and that police had sought a warrant for his arrest in the slaying. The court denied the request, saying more information was required. “He was like a father to me, and losing him was extremely difficult, both for myself and my family,” he said. Police in Windsor, Conn., have said the slaying remains unsolved. Carman, who was raised in Middletown, vanished when he was 17 after his beloved horse died, according to published reports. He was found four days later in Virginia. His father, Clark, who flew in from California this week to meet his son after his rescue, said Wednesday that his son had lost the two most important people in his life. “I know he would never do anything to harm them,” he said. Clark Carman described waiting in fear in California as his son and ex-wife were missing. “There was nothing I could really do at that point,” he said. The Chinese freighter that rescued his son was the only ship he saw in a week. “It’s a miracle, really,” Clark Carman said. “The investigation revealed that Nathan’s boat was in need of mechanical repair and that Nathan had been conducting a portion of these repairs upon his own volition which could have potentially rendered his boat unsafe for operation,’’ police wrote in the search warrant affidavit. “The investigation has also revealed that Nathan had intended to go fishing farther off shore in a different location than what were his mother’s intentions and understanding,” police said. Police recovered a Garmin SIM card, a letter from a pickup truck, and an Xfinity modem with cable. Carman said he and his mother were trolling for fish the day after they left at Block Canyon, an area in the Atlantic Ocean about 100 miles off New York, when the engine failed and the boat began taking on water. A friend of Linda Carman’s told police that she had repeatedly refused her son’s request that they fish in the “Canyons,’’ and always demanded they remain off Block Island, where they were supposed to be fishing for stripers. But Carman told people at the marina where his boat was docked that he was planning a trip to the “Canyons,’’ police wrote. Carman declined to say why he went fishing at Block Canyon but said he had explained it to the Coast Guard. Mike Iozzi spoke with Carman at Ram Point Marina before Carman set off to sea. He said Carman was friendly but quiet. “You had to pull the answers out of his mouth,” the 71-year-old said. In the hours before he set out to sea, Carman was removing the trim tabs from his boat, according to Iozzi. “They don’t make the boat respond well,” Carman told him, Iozzi recalled. Iozzi said he didn’t know what that meant — he and another boater said they would never remove their trim tabs. Still, Iozzi didn’t want to look over the young man’s shoulder. Carman patched up his boat with sealant, Iozzi said. In Vernon, Vt., where Carman lives, a neighbor said Carman bought the old farmhouse about two years ago and began tearing off the second story and building three new stories, all by himself. “I’d hear him pounding nails from daylight to dark,” said Maynard Rounds, who lives across the street. But he didn’t seem interested in striking up a friendship. John Ellement and Sean P. Murphy of the Globe staff contributed to this report. Andy Rosen can be reached at andrew.rosen@globe.com. Evan Allen can be reached at Evan.Allen@globe.com. Shelley Murphy can be reached at Shelley.Murphy@globe.